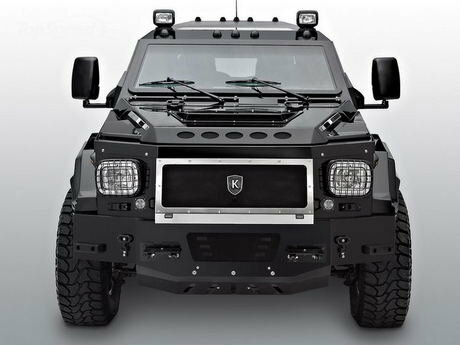 The Knight XV is a limited edition ultra luxury, high security vehicle by the company Conquest. This military inspired SUV puts all other "armored vehicles" to shame. The Knight XV's exterior is a coat of armor. The body (opaque armor) uses high strength steel and composites that can resist many forms of attack and the glass elements (transparent armor) are made by leading ballistic transparency manufacturers. The tires are Ballistic Run-flat Tires mounted on 20" or 22.5" forged 6061 aluminum rims which is the same material used for commercial aircraft landing gear. The Fenders and bumpers are mad of a ballistic fiberglass with kevlar. 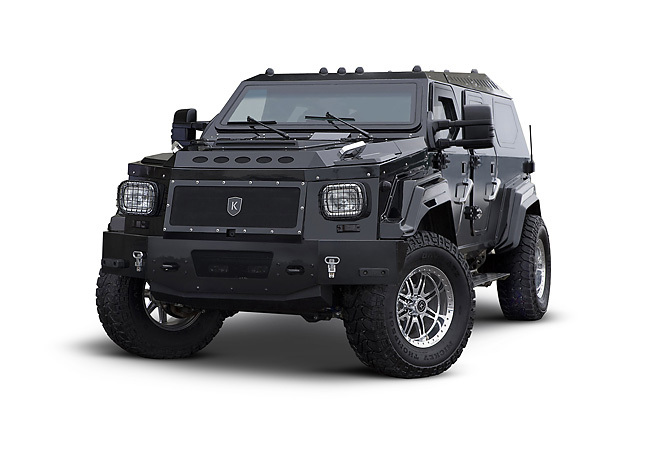 The Knight XV is built on a Ford F550 Super Duty chassis and weighs about 13,000 pounds. It has two engine options either a Ford V10 6.8 liter gasoline or a 6.7 liter Ford Power Stroke V8 Diesel engine by Cummins. Upgraded engine packages are available for the Knight. A turbo charger for gas and high performance upgrade for the diesel engine that brings it to around 400hp. The spacious interior has six seats hand crafted in Andrew Muirhead Leather. The same leather that Bentley and Lamborghini uses. The floor is Wilton wool luxury carpeting. There are multiple upgrades available like satellite TV, cigar humidor, and any other multimedia systems you could think of. Conquest is a Toronta, Canada based company and they have succeeded in building probably the baddest street legal vehicle of all time in the Knight XV. The Knight XV is priced around $629,000. Get them while they're hot because there's only 100 being made.